Health & Wellness: Capital Area PT! This Malta based Physical Therapy business is now expanding with another location in Queensbury NY. Their new website is designed to grow with their business! 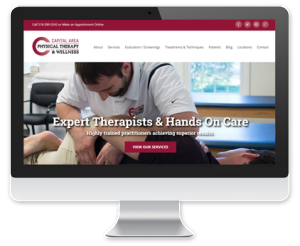 Andrew Gaetano, PT, DPT, OCS, CSCS and Evan Marsh, PT, DPT are committed to providing their clients with the highest quality care, and wanted a website that shared their vision for wellness with their patients. We designed a parallax-style site that is easy to browse and learn about their practice. Just for Fun: Lake George Goony Golf! Goony Golf has been a Lake George family landmark for more than three decades! We updated their old site to provide more information and images, and were able to have some design fun in the process! 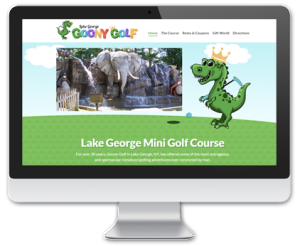 Goony Golf is the family fun go-to destination just off Exit 21 of the Adirondack Northway. 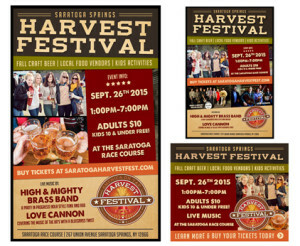 Graphic Design & Marketing: Saratoga Harvest Festival! Hospitality: Quality Inn Lake Placid! 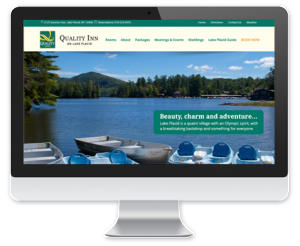 In the heart of the Adirondacks, Quality Inn Lake Placid wanted to update their look to highlight their great accommodations, amazing location, and amenities. They offer seasonal specials, area information and you can even book a pool party! Exceptional service is their trademark.